LIVES THAT I HAVE SAVED AND FOUND THERE FOREVER HOMES!! 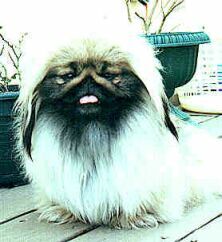 PEKINGESE'S THAT HAVE BEEN SAVED FROM KILL SHELTERS AND PUPPY MILLS! 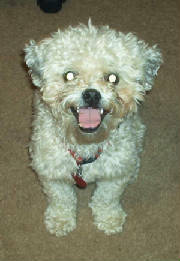 THIS SWEET BOY WAS A PUPPY MILL THROW AWAY! HIM AND HIS SIBLINGS WHERE DROPPED OFF AT A VET IN MISSORI TO BE KILLED! THEY WHERE BORN BLIND! 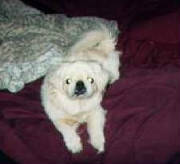 THE VET HAD A HEART AND CALLED A RESCUE GROUP THEN THEY CALLED ME HERE IN FLORIDA AND I SAID GET THEM TO ME, TOO SAFTY! WELL, SADLY TO SAY HIS SIBLINGS DID NOT MAKE IT OUT OF THE VETS AS THEY DIED!! BUT THIS SWEETIE MADE IT TO ME AT 10 WEEKS OLD. HE WAS EXTREAMLY LITTLE FOR HIS AGE AND UNDER WEIGHT! I TRIED DESPRETLY TO GET HIM TO EAT! I STARTING MAKING SHAKES OF BANNANA AND MILK AND VITAMINS AND SURINGED FED HIM FOR TWO WEEKS BEFORE HE WOULD FINALLY EAT ON HIS OWN. IT WAS LIKE HE GAVE UP ALREADY IN HIS SHORT LIFE! BUT HE MADE THE TRIP AND I WAS DETERMEND HE WAS GOING TO MAKE IT IN THIS HARD TERRIBLE WORLD. SO WE DID! 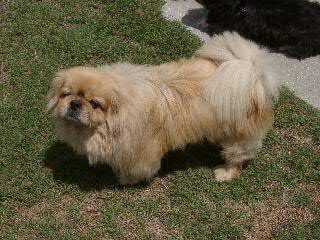 A WONDERFUL FAMLY IN WEST PALM BEACH FELL IN LOVE WITH HIM AS I DID! HE HAS WENT THREW AN EYE SUGERY. HIM AND HIS NEW LOVING FAMILY ARE DOING GREAT! 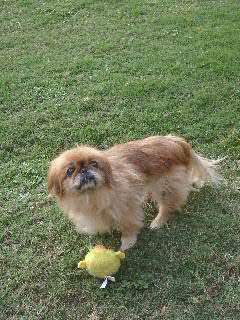 HE HAS A PEKE BROTHER AND A PEKE SISTER TO SHOW HIM THE ROPES OF THE ROYAL LIFE OF A PEKE AND THE WAY ANIMALS SHOULD BE TREATED IN LIFE! THANK YOU SO MUCH DANA FOR BEING A LOVING CARING SOUL OF GODS ANIMALS! These are past rescue's that have been saved and brought back from deaths door. They have been adopted to loving homes and wonderful family's! 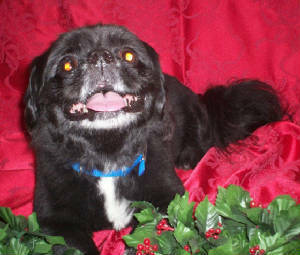 Gizmo was saved from the Levy county kill shelter on X-Mas Eve. He was very cold and lonely when I went and picked him up. His parents died so his other family put him in a kill shelter. He was adopted by a very loving family and is very much loved. 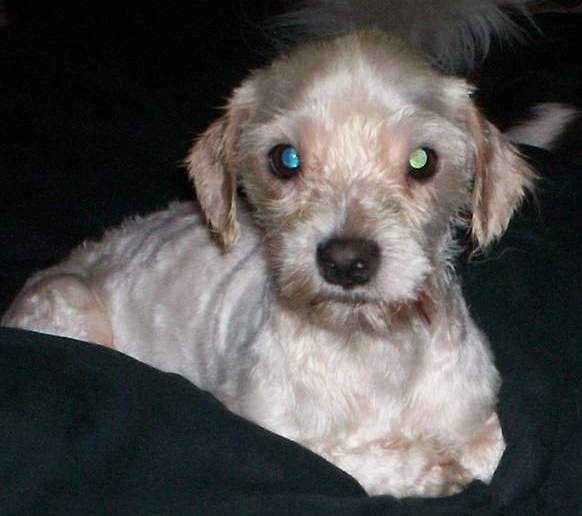 This is Di Di, he was put in a kill shelter in GA because he didn't like men or small children. Over all he is a very loving little guy. He was in good health except for a worm infestation. 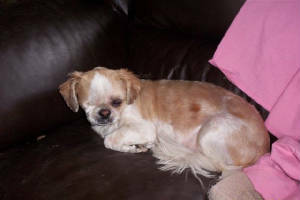 He has found his loving family and loves them very much as they do he! This is Lady she was pulled from a high kill shelter in Jacksonville, FL. She was on her last day before they where going to put her down. 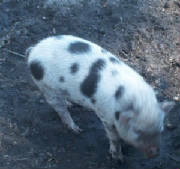 She was a very sick little girl, very underweight infested with worms. She was adopted by a very loving couple. she is very much loved by her new family! 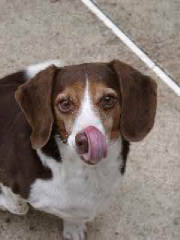 This is Lady she was in a high kill shelter in GA. She was also on her last days! All she needed was some dental work and spayed. 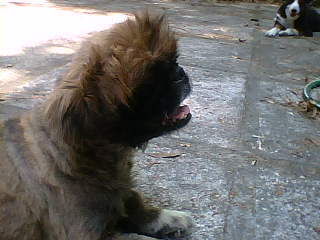 She was a owner surrender, because nobody wanted her anymore. 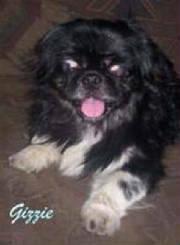 She has also found a very loving home in Gainesville, Florida. This is Queenie, and her name fits her well. She is a total love bug. She was saved from a kill shelter in South Florida. 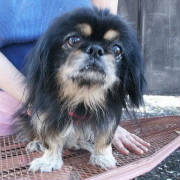 She had severe flea dermititis and most of her hair was gone, sores all over her body from the flea infestation. 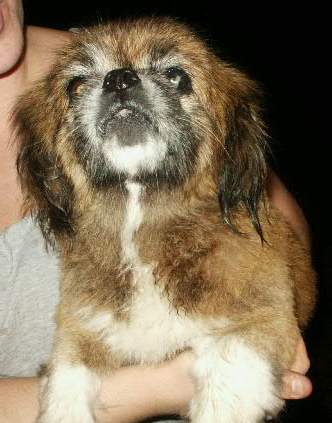 She has found a very loving home in Ocala, Floirda and very much loved. 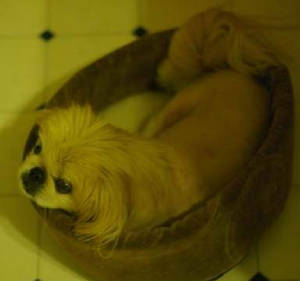 This is Knockers, she was rescued from a high kill shelter in GA. She was a owner surrender due to her blindness from birth and her owner no longer could care for her due to her disabilites. 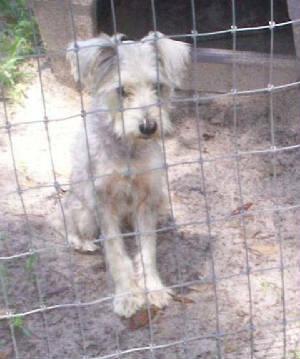 She has found a loving home with a very loving person here in Ocala, Florida. She is very much loved in her new home. 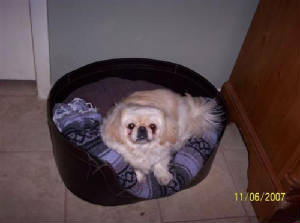 This is Sandie. 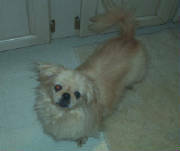 She is a love bug but a one man owner who didn't like small childern or anybody else to share her owners attention. 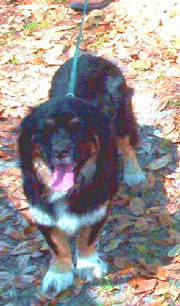 She was also put in a high kill shelter in GA.
She has found a home in South Florida. This is Drew and Tiff. They had to be adopted together as they grew up together they are brother and sister. 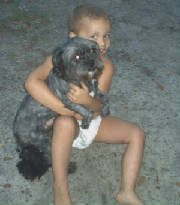 They came from another rescue group and was adopted here by me in Dunnellon, Florida. I did the last leg for the foster home to there new home. They are very much loved and spoiled in there new home. 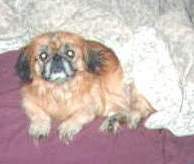 The people who adopted her had a set of pugs and they passed away, they contacted us for peke's and they where so happy to get a set of pekingese. They are in love with these two love bugs. I am sweetums. 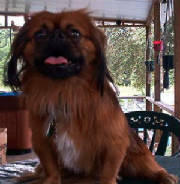 I was adopted by Helping Hands Rescue in Gainesville Florida. My foster mommy sent me to them b/c I needed extensive vet care! They made me all better and found me a loving home. Thank you very much Helping Hands! Hi, my name is Buddy! I have found my forever parents in Miami Florida. They are the best parents other than my foster mommy! They love me and I want and need for nothing ever again! Hi, my name is Buster! I have found my forever home here in Ocala, with a lovely family! I was already spoiled when I left my foster mommy! We went to pet smart and my new mommy bought me lots of neat stuff. I know I am going to love my new family! 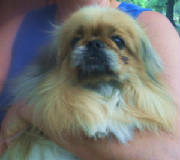 Sugar was adopted by a lovely older women in South Florida! She lives alone and Sugar was that perfect compainion for her! They will very much love each other dearly! 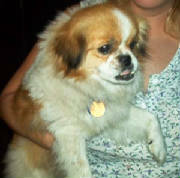 Bandit was adopted by a lovely women from Loxahatchee Florida, and has a new brother peke. He is very much loved with his new family! 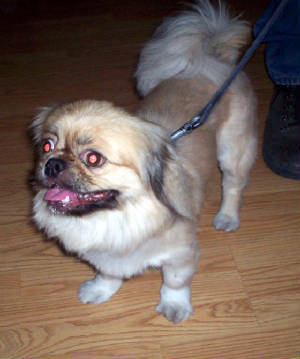 Hi I am Sunnie, I have been adopted by a lovely couple in Hawthorne Florida! I am going to be very much spoiled and loved in there home! 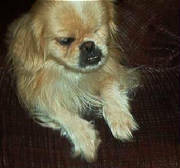 Honey Bear was adopted by a lovely older couple in Gainesville Florida who are going to have her caterac removed from her one eye, so she can see again! A couple sent from God to help her! Bless there hearts and hers! 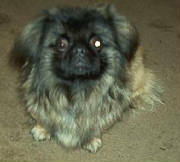 Hi I am Dutchess I was adopted by a very loving lady in Daytona. I am living the life I was suppose to be! I am very happy in my new home! 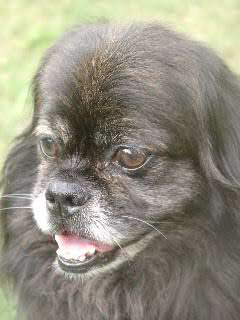 COCOA HAS GONE TO A LOVING HOME IN WILLISTON FL. WITH A WONDERFUL MATURE COUPLE! 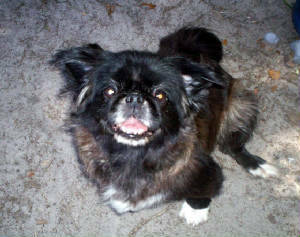 INKY HAS BEEN ADOPTED TO A WONDERFUL FAMILY IN EAST FLORIDA THAT ARE GREAT FRIENDS OF OURS! HE IS TRUELY LOVED BY THEM AND THERE GIRLS! 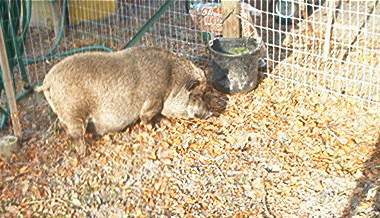 SUNSHINE WAS ADOPTED TO A FAMILY WITH OTHER POT BELLY PIGS IN LAKE CITY FLORIDA! SHE WILL BE A HAPPY CAMPER! DOLLY HAS BEEN ADOPTED BY A WONDERFUL DAD! NO KIDS, NO OTHER ANIMALS! SHE IS GOING TO BE SPOILED ROTTEN! HI, I AM ELLIOTT! I HAVE BEEN ADOPTED BY A WONDERFUL COUPLE IN GAINESVILLE FL. I AM GOING TO BE SPOILED ROTTEN! HI MY NAME IS NICK NICK! I WAS ADOPTED BY A LOVELY FAMILY HERE IN OCALA, FLORIDA! MY SISTER IS A KITTY AND WE GET ALONG JUST FINE! 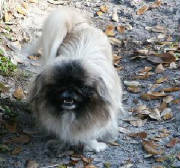 PRESCIOUS IS LIVING WITH A LOVELY FAMILY IN FT. MACOY FL. SHE IS LIVING ON A FARM WITH DUCKS, COWS, HORSES AND HAVING A BLAST! ADOPTED BY HIS FOSTER FAMILY!